I received my law degree in 1955, and after a demanding and difficult selection process, I worked for the Spanish Government for many years as a civil attorney. During this time, I spent a great deal of my free time writing literature, a pursuit that I began in 1976. As a member of the legal profession, I was in the privileged position of being able to develop a deep understanding of the many conflicts of interest that human beings are subject to and the legal context in which they are so often framed. In keeping with my vocation as a writer, I maintained long friendships with the most famous Spanish writers of my age, including Vicente Aleixandre (Nobel Prize for Literature, 1977); Carlos Bousoño (Prince of Asturias Prize, 1995), who dedicated his complete poetic works to me; José Hierro (Cervantes Prize, 1998); Francisco Brines (Spanish National Prize for Literature, 1999, and Queen Sofia Prize for Iberoamerican Poetry, 2010); Paco Nieva (Prince of Asturias Prize, 1992); Claudio Rodríguez (Prince of Asturias for Poetry, 1993); and Alfredo Bryce Echenique (Spanish National Prize for Narrative, 1999, and Planeta Prize, 2002), among others. Carmen Balcells was my literary agent from 1978 until 1988, at which point I decided for personal reasons to publish my work on my own; this has been the case until the present day. I am currently looking for a publisher to relaunch my work; I have no contractual obligations to any of the publishing companies that I have collaborated with in the past. - Mirror of the World (novel). - A novel "Confessions of a child of our time". - The novel "To live, to die" starring with Nazism. - The novel "The man of smoke" where there is love, thought, and, above all, music. 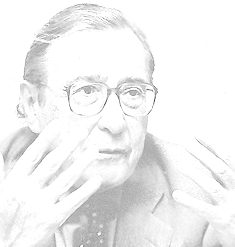 1992 – Reference to my work in History and Criticism of Spanish Literature, edited by Francisco Rico. This honor came after many interviews and favorable critical pieces published in various newspapers and literary reviews. Since 2002, I have been reworking my novels with the goal of making their translation into English simpler. My friends, great writers of my generation, advised me to open my literature to English-speaking readers. I have revised and streamlined my novels, making their narratives more direct, and clarifying their more obscure points, thereby permitting the reader to stride through them without stumbling. Clearly, this should be the goal of all writers, although I am not sure of having fully achieved it myself. I am currently writing a short novel, and am working to launch my work in the English- speaking countries and Latin America.